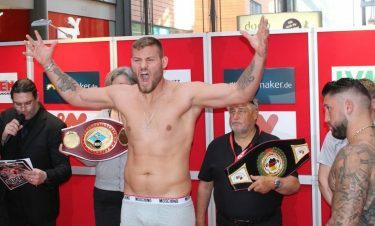 European heavyweight belt holder Agit Kabayel (17-0, 12 KOs) will be back inside the ring this Saturday to defend his EBU strap against Serbian Miljan Rovcanin (18-1, 12 KOs) on April 21 at the Estrel Hotel in Berlin, Germany. Kabayel, 25, trying to keep the momentum going with his big 12 round majority upset win over former heavyweight world title challenger Dereck Chisora last year on November 4 in Monte Carlo. Kabayel took advantage of Chisora’s lazy manner of fighting by out-hustling him to win a decision by the scores 115-114, 115-113 and 114-114. Chisora looked unmotivated, lazy and out of shape for that fight. Looking like a seasoned pro, Kabayel took advantage of Chisora’s off night by squeaking by with a razor close victory. Kabayel, 6’3”, 237 pounds, looked weak for his size, and unable to stand his ground and fight Chisora, Kabayel mostly used his superior hand speed to land quick shots and then get on his bike to move a lot. Kabayel is the best fighter on the card in my estimation, but he’s going to have to work on his punching power, because he’s not going to go far in the division with the way he looked against Chisora. At 6’3”, Kabayel already has a strike against him in having to compete with the 6’7” WBC heavyweight champion Deontay Wilder and 6’6” IBF/WBA/WBO heavyweight champion Anthony Joshua. It’s a positive that Kabayel is the EBU champion, but if he wants to accomplish more than that, he’s going to need to develop his man strength at some point for him to get to the next level. Former British and Commonwealth heavyweight champion David Price said last week that he’s going to after the EBU heavyweight champion. That could be a tough fight for Kabayel. Price was knocked out in his last fight by Alexander Povetkin, but he generally does well against non-punchers, and Kabayel has nothing in his armament to keep Price off of him. I think it could end badly for Kabayel if he can’t stay out of range of the 6’8” Price’s big shots. The 24-year-old Rovcanin is coming off of a 2nd round stoppage win over journeyman Drazan Janjanin (19-21, 16 KOs) last month on March 11. Before that fight, Rovcanin was beaten by past his prime 35-year-old Alexander Dimitrenko by a 10th round disqualification. Rovcanin was penalized three times in that fight. Other than that fight, Rovcanin has wins over obscure journeymen level opposition since he turned pro in 2012. His management has been slow in moving him up against better opposition. This is a pretty limited bunch of opponents for Schwarz. Of those fighters, Airich (24-18-2, 18 KOs) seems to give Schwarz the most problems. Airich was 37 at the time and he’d recently been knocked out by Anthony Joshua and Mariusz Wach. The fact that Schwarz wasn’t able to dent Airich’s chin suggests that he doesn’t have as much power that he needs for him to make it at the upper tier of the division. Schwarz has the size to be a big puncher, but for some reason he can’t punch. That means he’s going to have to win a lot of his fights by decision. That’s not good when you’re facing the likes of Wilder and Joshua, who will be bouncing right hands off the head of Schwarz. 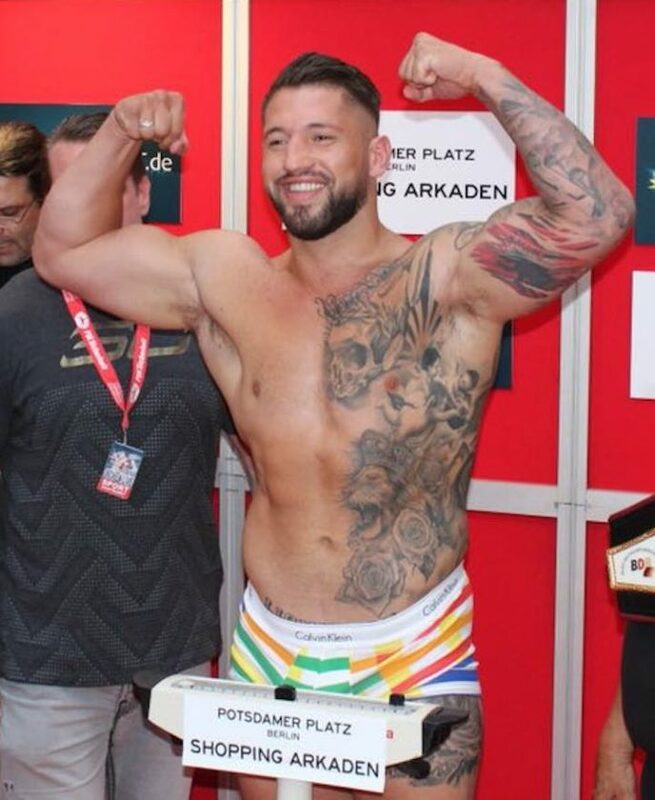 The German fighter doesn’t have to worry about those talents right now, but sooner or later he might be facing one of them. Unless he finds some power somewhere, it’ll be a short night.